We have put together a list of suppliers to help you create your perfect wedding day. They all know the Mill, what works (and what doesn’t), what we have here and what we don’t. 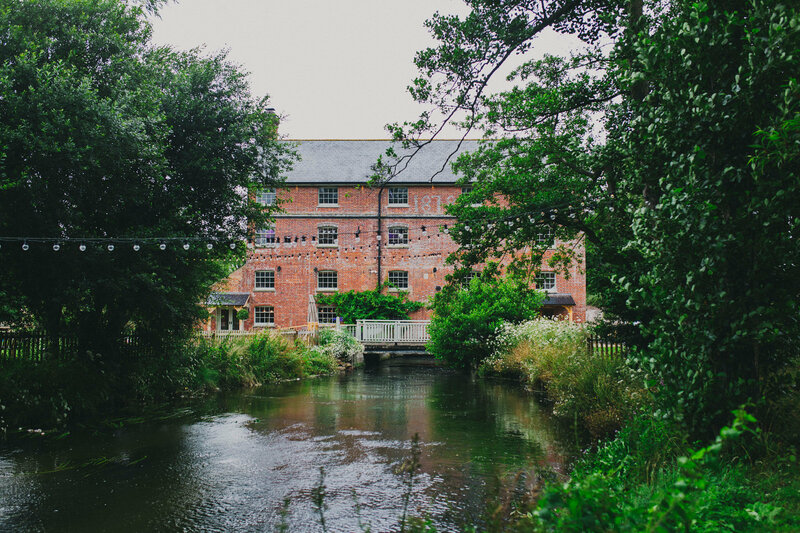 These suppliers will have the answers to all your questions about creating your wedding at Sopley Mill. You don’t have to use them – Granny may be a dab hand with icing cakes and your mother may have a gift for floristry. But if you need professional help they know their stuff. Gemma Leanne is a friendly local musician specialising in Weddings and Events and very proud to be a chosen supplier for the top wedding venue Sopley Mill. Gemma can play a range of relaxing Piano background music to upbeat Acoustic Guitar sets giving a huge range of songs, styles and genres from all through the years (60's to current chart hits)! With experience of playing at a multitude of weddings and private functions Gemma can provide music for your Ceremony, Drinks Reception, right through to your Wedding Breakfast so the whole afternoon of live music is provided leaving you and your guests at complete ease and singing & swaying along throughout the day. Please contact Gemma direct for enquires on availability and different packages to suit your perfect day. Feel free to follow her Facebook Page Gemma Leanne Music for demo videos and past genuine reviews. Hope to hear from you soon, happy planning! Soulstar are a fun bunch of talented, multi award winning musicians recently crowned Best Live Entertainment at The 2018 Dorset Wedding Awards! We LOVE a party, we LOVE playing music and LOVE having fun whilst we do it! Our acoustic duo is perfect for creating the ideal atmosphere for your ceremony or drinks reception and our exceptional party band gives the perfect ending to your wedding day. You and your guests will be up dancing with us all night and if your guests are up for it, we LOVE a dance off or singing battle! We’re honoured to be a recommended supplier and would love to speak to you further about creating the right package for you. Visit our website to see our live videos and get in touch! Cover Up are a professional, fresh and versatile 3 piece party band from Southampton. Playing together for over 6 years they have built up a repertoire of well over 100 songs, allowing them to perfectly tailor a set for any Wedding, Function or Party. Available for both acoustic and electric sets, they can create an ideal atmosphere for any event. Check our availability for your Party, Wedding, Festival or Live music venue!! Another fantastic band that is professionally managed by the experienced team of Nick Leigh at Tailored Entertainment and Iain Martin at Stiff Promotions and one that we highly recommend for your wedding at Sopley Mill. Festival Sons is a festival style wedding band bringing to life some of your favourite bands right to your wedding reception! From the likes of Mumford & Sons, to the Killers and Ed Sheeran, Festival Sons is bound to delight and thrill guests and there is no doubt that the dance floor will be packed! Based in Surrey, OJ's Soul Band are the UK's leading Soul & Motown Band and were brought together by leading music management company Performing some of the most incredible arrangements of the biggest Soul & Motown hits - this band and their style of music are sure to get you and your guests hitting that dance floor to the glorious sweet sounds of Kool & The Gang, Lionel Richie, The Jackson 5, Whitney Houston to the more modern artists such as Bruno Mars, Olly Murs and Gnarls Barkley- it's time for uptown funk! The Benedicts are Hampshire's most popular 4-piece wedding band who perform anything from Rock 'n' Roll to Rhythm 'n' Blues; from Pop to Rock and Funk to Soul - anything that will get you and your guests dancing well into the night. The Benedicts are a friendly and professional bunch of guys who will work with you to tailor-make the best live music line up that suits you as well as your budget. The Benedicts have performed successfully at Sopley Mill before and we highly recommend them. A word from Tailored Entertainment: "Tailored Entertainment specialise in exclusive representation of the UK's finest live bands for your wedding at Sopley Mill. Our select roster features bands in a huge range of styles from Soul & Motown to Indie Rock and Jazz to Vintage/Festival style, as well as soloists and duo's - such as pianists, guitarists, singers and live lounge style acoustic acts. We pride ourselves on providing only the best, professional musicians for all aspects of your day - from the ceremony to the drinks reception, to the evening party we would absolutely love to help make your day even more special! We are always available for a friendly chat and will ensure the booking process is simple and efficient from the start to finish. The attentive booking service and very high standard of our live acts has secured Tailored Entertainment's place as a leading entertainment agency for weddings and events in the UK, so please do contact us about we can do for your wedding at Sopley Mill". Why not try something quirky and different and have delicious coffee, tea, hot chocolate and milkshakes from Southbourne based Barista Bike. We use specialty coffee beans from Winchester Coffee Roasters which are ground for each shot of espresso to ensure the freshest taste and aroma. Tea is provided by Dorset Tea with a full selection of traditional, fruit and herbal blends available. Our hot chocolate is made using ground Belgium chocolate (52% cocoa solids) combined with freshly steamed milk. If you want to provide coffee for your wedding or event at Sopley Mill, provide coffee that your guests will remember. "I am a mobile bridal hair and makeup artist, giving you and your bridal party the option to get ready in the comfort of your chosen location. I make sure that the entire bridal party feels relaxed and able to enjoy the unique experience of having a dedicated hair stylist and makeup artist. I’ve been told by my clients that my skills lie in creating a flawless natural looking face with perfect skin, combined with beautiful, effortless hair styling. I am passionate about enhancing natural beauty and allowing the bride’s personality to shine through, so that she feels the absolute best version of herself on the big day. I offer a no obligation, free consultation for both hair and makeup, and include prosecco (not compulsory!) during the bridal trial to enhance the experience. On the day itself I include lashes for all the bridal party as well as a high end lipstick or gloss for the bride. I am proud to offer bespoke discounts with local wedding beauty specialists, and have lots of advice for any last minute beauty crises that may occur. I have been published in Riddle Magazine and worked at high profile events including the National Television Awards and London Fashion Week. I am also proud to have been chosen as a beauty team member by Alessandra Steinherr to work as part of the beauty club at Glamour Magazine." I am a fully insured, Freelance Makeup Artist specialising in Bridal makeup. I have 10 years experience working within the industry, and have helped hundreds of beautiful brides perfect their looks for their very special days. I offer my makeup services in the comfort of your own homes or chosen venues, to ensure you are at your most comfortable and relaxed. Whether you want a flawless, natural bridal look or if preferred a more glamorous option , every look I create will enhance your features leaving you feeling amazing. I aim to build fantastic rapports with every individual I meet, and this reflects on my reputation in Bournemouth and surrounding areas. Tracy designs and creates intricately detailed wedding headpieces, jewellery and a range of beautiful accessories for the bride to be and her wedding party. Attention to every little detail, the quality of the materials used, and her ability to match the items to your wedding theme have become her trademark. Specialising in bespoke pieces with a vintage twist, her creations will be much admired and treasured forever. "At the heart of this business is a fountain of knowledge, creativity and inspiration. This is where we stand out from the crowd - We exude enthusiasm and passion and are genuinely just as excited about being part of your big day, as you are to be the leading role! We run every event with clockwork precision, and we have managed events in some of the most unique and obscure locations. It's not easy planning a wedding, as soon as you confirm/ tick one item off your list it opens up a whole subcategory of decisions to be made. We will take the time to guide you through the dishes best suited to you as a couple and for the big day, working in sync with your theme and ensuring that all of your guests' dietary requirements are met. We will discuss every detail of your day to ensure that we work seamlessly in delivering your dream day, flowing effortlessly from the beginning to the very end. On your wedding day, the Ginger team will provide a professional and attentive service - our team of experienced waiting staff will enjoy serving your guests and ensuring each and every one of them is happy. We love creating stunning food and tasty memories for you and your guests to cherish forever. We can provide everything required for your wedding catering - cutlery, crockery, glassware, tablecloths, napkins - tables and chairs, and everything else you could need, these can be tailored to your theme or colour preferences, so another item ticked off the to-do list!" A word from Beales: "Voted as Dorset's Best Wedding Caterers, Beales Gourmet deliver nothing but the highest quality. With a chef team focussed on delivering only the most spectacular canapes and wedding breakfasts, we strive to completely exceed the highest of expectations using the very best local, seasonal ingredients. With inventive and experimental cooking styles and presentation, the cuisine prepared is modern and stylish, as our chefs continually deliver heavenly food for bridal couples and their guests. NOTHING is more important to Beales Gourmet than the lasting memories we help create for brides, grooms and their families. After all, this should be the most memorable day of your lives - and that is why the service delivered is always as impressive as the food served. Beales Gourmet will make your day truly unforgettable! Beales Gourmet have a wide variety of seasonal menus to suit your special event. You will have a team of some of the best trained chefs in the region laying on sumptuous cuisine for you and your guests. No matter whether you prefer a gourmet wedding breakfast or deluxe garden barbeque, all of our menus are created bespoke just for you." "The service delivered is as outstanding as the cuisine served!" A few words from Vanilla Catering: "Vanilla Catering and Events Ltd operates from premises in Swanwick Marina on the River Hamble. Vanilla's key ethics are attention to customer service and the use of top quality local ingredients. These result in bright, modern, food styles, utilising the freshest of local ingredients, and presented with attention to detail in an unfussy yet friendly manner. On booking with Vanilla each couple is assigned a wedding planner who advises on everything from menus to table plans to timings - this is all part of the Vanilla service. Our menus are bespoke and they are designed in consultation with each couple and our team of professional chefs so you get to choose exactly what you want, no menus A,B or C with Vanilla - every dish is handcrafted for you the client." "With a passion for sourcing the best of local seasonal ingredients, such as line caught seabass, free range pigs from Bridport, Christchurch bay lobsters, Dorset lamb, Lymington crabs and Sopley asparagus we get the freshest of local produce at its best, support the local economy and keep down our carbon footprint. We take these fantastic ingredients, cook them simply, present them stunningly, and serve to our customers with a smile on our faces." A few words from Signature Catering: WE LOVE FOOD! Whether it's fresh baked bread, New Forest meat, poultry & game. Sustainable fish & seafood, or the best of British seasonal produce. At Signature Catering Co we understand organising your wedding day or function can be a stressful task for people. Furthermore we will give you and your guests our undivided attention. We want you to be able to relax and enjoy your day, safe in the knowledge that the food and service is taken care of to the very highest standard. We will strive to make your event run seamlessly and pride ourselves on our flexibility towards every event, with seamless professional service alongside our carefully tailored bespoke menus. Emphasis is put on the individuality of the every event, and our chefs can tailor a menu to suit your occasion. You will be in personal contact throughout the organisation and on the day of your event with our Events catering manager Anita. Based on the Dorset and Hampshire border on the edge of the New Forest, we have great access to all of the fantastic fresh local ingredients and delights that the two counties have to offer. Our wines have been carefully selected for you enjoyment from local producers; a full list is available upon request. We also run two very successful restaurants. We opened 'Seasons' fifteen years ago, set within a beautiful 18th century barn within Moors Valley Country Park. In 2011 we opened our second restaurant, 'Seventh Wave' in the beautiful renovated Durlston Castle, Swanage. A few words from Merlins: "Why Merlins at Sopley? We never forget that it is your day and work in unison with the Sopley Mill team, the results are outstanding. Our reputation goes before us for quality cuisine and we are passionate about our food. It always has to be ethical and local, that is where our heart lies. It is service with a smile the whole way, with our expert wedding specialists helping you at every stage to create the wedding day of your dreams. Whether it's a fully serviced wedding breakfast or relaxed luxury barbecue, we have menus to suit. We pay particular attention to guests special dietary requirement and our vegetarian options are simply delicious. At Merlin we are all about the details, so whatever your question, do get in touch, we have years of experience to share with you. Our brochure is available to be emailed to you immediately and you can obtain an initial quotation from us, with pleasure." "Build up your dream celebration feast and lay on a fiesta for your big day at Sopley Mill with Idelica's Spanish Paella and Tapas Catering. Start off with some Tapitos downstairs for guests to graze on at the Reception. Then have your guests greeted with dining tables laden with delicious Antipasti on sharing boards as they sit down to a Spanish-styled Wedding Breakfast. With our paellas as the main event, all tastes and dietary requirements are easily catered for as you get to choose from meat, vegetarian, seafood or a mixture of Paellas, either served directly to guests or in sharing pans and with side options available. Our new Afters Platters with a selection of Rustic Spanish-styled sweet and savoury bites allow diners to satisfy their own appetites and tastes perfectly. Our Street Food Tapas Bar and Pizza Stand offer delicious and convenient choices for Outdoor Evening Food. Alternatively we can create stunning Wedding Cheese Cake and / or Antipasti Indoor Buffets, day or evening, with an eclectic mix of excellent locally sourced fresh products and imported Spanish fine foods. Call or email Emma Lopez who will be happy to talk through the possibilities and put a quote together for you." I am an experienced Civil Celebrant and create bespoke Weddings and Renewal of Vows ceremonies. It is my passion to tailor your ceremony exactly to your requirements and am always on hand to suggest ideas if necessary. You will have already completed your legal formalities so we are free to focus on the elements you really want in your celebration. You can still exchange vows and rings and can include readings or symbolic acts from any religion or none. As a Civil Celebrant and not a ‘Humanist’, you can include religious aspects in your ceremony should you wish. Please see my website for more details. "We had so many comments about the ceremony from family and friends, all of them saying it was the best ceremony they'd ever been to and you were fantastic..." Wedding Ceremony, July 2018. ​ "It was absolutely perfect. We could not have asked for a better celebrant and we’ve had so many lovely comments about you from our friends and family. We seriously cannot thank you enough because the ceremony really was just exactly how we wanted it to be..." Wedding Ceremony, August 2018. More information coming soon. Sadly we do not have enough storage space for cutlery and tableware etc so we ask for all these items to be delivered on the morning of your wedding and collected by 09:30am the next day. We highly recommend Wessex Catering Hire who are able to do this even on weekends. Wessex can also provide water boilers etc. Aside from marquees, Castle Marquees also provides dance floors at Sopley Mill for any couples wanting to branch out from the norm and go for a barn dance or a Scottish Reel or ceilidh for which you would need to hire in a dance floor to cover the area you require - please speak to Steve and the team as they know the exact sizes you would need. For more information please see our FAQ's. We only work with Castle Marquees due to the fact that they have worked with us at Sopley Mill on numerous occassions and they are fully aware of what is required in terms of sizes, timings of the fitting together and removal of the dance floors and how the Mill works. They are a family run business and a professional team. Our quirky vintage Airstream replica Rosie, was custom built and has been serving stunning wood fired pizza's since 2014. We cook in the most traditional way for pizzas in our wood fired oven at 400 degrees! We cater for lots of different events including WEDDINGS, birthday PARTIES and CORPORATE events. We have lots of menu choices and packages to suit all budgets. All of our ingredients are from local suppliers and bought fresh for every event to create the tastiest meal possible. We cater for many dietary requirements including Dairy free, vegan and gluten free. With the fire roaring and the chimney smoking, our van creates the perfect atmosphere anywhere. Working from a vintage Citroen HY van, Chris and the team at The House Grille bring to you a large variety of catering options for your evening celebrations. – BBQ, wood fired pizza, tapas, hot and cold buffets, street food, retro classics. Hog, lamb or venison spit roasts and more. We give you the best service with style, artisan flair and a sense of theatre. Fish & Chips have always been the nations favourite. MobyMicks, cooking amazing Fish & Chips, as well as other favourites outside your venue. We also provide you with knives, forks, and all condiments. Mushy peas, curry sauce, and other extras can of course be provided, according to your requirements. We take all the trouble out of organising the food, and clearing up, at very competitive prices. Having Fish & Chips as your evening reception food choice, will certainly please your guests. More information coming soon. The Jalopy Pizza Van really is perfect for a lazy summer's evening, sitting outside the Mill watching the sun set. Offering a personalised service with a team of six experts creating exquisite bridal flowers and unique displays, all prepared lovingly at our nearby workshop. As venue decorators Simply Flower also offer a huge selection of lighting, venue dressing and prop hire equipment to make your day even more unforgettable. "We are a small but passionate family run business that just loves a bit of mini / crazy golf! You won't find another place in Dorset that does what we do, so congratulations on finding us! Our brilliant crazy golf course hire can travel to all areas of Dorset, Hampshire, Wiltshire, Somerset, Devon and beyond. Our core values are to provide fun family entertainment in a safe and relaxing setting, for family & friends to enjoy quality time together. We bring this all together with a great fun quality product and superior customer service." We are very proud to be able to provide our premium bar service at this magnificent venue! We are a passionate team of highly trained bartenders and specialist cocktail makers. We have supplied hundreds of bars for weddings and events over the last few years and we love working alongside our clients to create the best bar service for their special event. When you book Sopley Mill for your event, we will be the bar supplier. Please get in touch and we will send you our full information pack on our services and packages. “We are friendly, reliable and we really care about you, your guests and your event" Tom Owen, Head Bartender. Don't worry - we didn't know what one was either! They are non-religious, much like a civil wedding, but unlike a civil wedding these are designed around you. A Humanist ceremony is more of a blessing and includes your family and friends more than a standard civil wedding. You would need to get married, on paper, at the registry office a few days before but then you on the day you have a full ceremony including the music you want, the poetry you like, any rituals you may choose such as wrapping your holding hands in ribbon and writing your own vows. You can do this anywhere, including out on the grounds. David Hewitt will meet you a few months before the wedding to find out more about you and how you met etc, so that he can design a very personal ceremony around you and your commitment to each other. Chilly White specialise in traditional ice cream tricycles and food and drink carts with uniformed servers throughout the year. The unique tricycles and carts hand built in the UK provide something different for your special day. Serving locally sourced ice creams, freshly baked waffles and great tasting popcorn to name a few, Chilly White will delight your guests with their great range of services. The tricycles come with beautifully decorated side tables which include a jug of flowers, napkins and tasty toppings. The Christchurch Premier Inn is just 6 miles away. Magic for the 21st Century! As Dorset’s only tech magician, Alfie has the capability of bringing your wedding themes to life, by making his magic completely bespoke and unique to you and your wedding guests. From personalised give-away items and impossible predictions, right through to cleverly designed digital apps; Alfie will ensure that your wedding is spoken about for years to come! Alfie is available to perform at Sopley Mill throughout the following periods of your special day: Drinks Reception / Photographs, Wedding Breakfast, Room Turn-Around Time and / or Evening Reception. Being local to the venue, Alfie also offers all his clients the opportunity to meet-up beforehand. Over coffee, he’ll propose when magic is best utilised for your day, as well as discuss any wedding themes that you may wish for him to use; a magic demonstration is of course mandatory! Contact Alfie today to make your wedding truly memorable! Magician and mind reader Edward Crawford has been performing his unique style of illusion for over 15 years. Those who have witnessed his stage show, his dinner show or close up magic at parties, dinners, banquets, balls, weddings and corporate events have never failed to be astounded by the experience. No matter what your requirements Edward’s unique act will be tailored to guarantee an unforgettable experience. Winner of the 2017 best magic act from Lux wedding awards. Edward has performed at Sopley Mill on numerous occasions and has a number of performances including close up, table magic, dinner show and full cabaret show designed to suit the venue. Ideal for weddings and all private and corporate events. If you are planning on getting married during the Summer months and would like to arrange for you and your guests to eat outside but with that peace of mind in case the weather turns, then a marquee could be the perfect option for you, or for couples who are getting married in the winter and would like to provide a cover over the terrace so your guests can still enjoy the beautiful surroundings of Sopley Mill, then Castle Marquees are definitely the guys to speak to. We only work with Castle Marquees due to the fact that they have worked with us at Sopley Mill on numerous occassions and they are fully aware of what is required in terms of sizes, timings of the erecting and removal of the marquees and how the Mill works. They are a family run business and a professional team and we cannot recommend Steve highly enough. The Photo Booth Bournemouth: "Entertain your guests and have the ultimate wedding reception entertainment, The Photo Booth Bournemouth's premium studio Photo Booth is a huge hit with all ages, guaranteed to provide laughter and memories.. Open plan setup (meaning we can get large group shots), All-inclusive packages (unlimited photos), Guestbook, USB, Facebook Upload and more! Discounts available Monday – Thursday." The Photo Booth Bournemouth. For any of your guests needing a taxi to Sopley Mill or a safe journey home, Christchurch Radio Cabs are a reliable and professional taxi company located in Christchurch. Chritax will give your guests a 10% discount if they pre-book a taxi with them. "Specialist in OUT OF THIS WORLD event design that will take your breath away. We add the wild & wonderful to your event without any limitations on your IMAGINATION. Whether we stock it, source it or have it made to your specification we will make sure your event is everything you dreamed of"
"BCT International Videos, produces 4K video production worldwide for weddings clients. We pride ourselves in attention to detail, bespoke videos and cater for clients who are wanting the personal touch and a memorable film to cherish forever. At BCT International Videos, we make sure that your wedding visuals are delivered to the highest standard, giving you memories that last timelessly." 'Dorset Dubhire offer a beautiful selection of classic chauffeur driven VWs for wedding hire throughought Dorset and the surrounding areas. Choose from our three bespoke wedding campervans Lulu, Lucy and Lillie and our delightful 1965 Beetle LIlah. Wedding insurance - for peace of mind! Please quote A0032 with reference to Sopley Mill. South Coast Weddings provide a practical wedding planning and on the day coordination service, keeping the wedding couple at the forefront of everything. Sam is professional, friendly, experienced and compassionate, taking all of your wedding stress away with a listening ear and a solution for every problem. If you’re looking for a calming influence on your big day, where everything happens as if by magic, then get in touch with Sam at South Coast Weddings for a chat. She’s always up for a cuppa & slice of cake. Let us help you make your Sopley Mill wedding, the most memorable day of your life! Rosamund gives an exclusive 'On The Day' wedding co-ordination to Sopley Mill. With an extensive knowledge and relationship with the suppliers at Sopley- Rosamund will help aid everyone in making the day as smooth running as possible! Offering personal and professional support for your wedding, giving you the chance to really enjoy your time and have a stress free day!